Avoid chemical and heat treatments such as, hot rollers, straightening irons, curling irons, etc. on your hair. Flip your hair upside down for a couple of minutes to stimulate hair follicles. Simply massage your scalp gently in circular motion with your fingers twice daily for a minute or two to improve circulation and help blood and nutrients reach the hair follicles. Try using a shampoo scalp massage brush to stimulate hair growth. Massage the scalp with a prong hair brush daily for about 10 minutes followed by brushing the hair with a natural boar bristle brush from the root to the ends to redistribute the natural oils on the hair and scalp. You can incorporate this hair care regime every night before going to bed. Trim your hair every six to eight weeks. This helps remove split ends, thereby facilitating healthy hair growth. Split ends do not usually prevent the growth of hair, but they are unattractive and make your hair susceptible to breakage. Interestingly, it is believed that trimming your hair during the New Moon phase makes hair grow faster whereas cutting your hair during the Full Moon decreases the rate of hair growth. The reason cited for this strange and unusual belief is that moon cycles tend to affect hair growth. Though not proven still, people have reported positive results after using Mane ‘N Tail horse shampoo as it moisturizes the hair and prevents breakage. Use a clarifying shampoo every few weeks or once in a month to remove scalp buildup. If you use more hair styling products or wash your hair with hard water, then you may have to apply the clarifying shampoo more often, even weekly or two times in a week. Protect your hair from the sun by wearing a hat and making a braid to avoid sun exposure on the ends. Take proper care of your tresses by maintaining a good hair care routine. Plus, keep certain tips in mind.For instance, do not brush wet hair as they tend to break easily. Rather, comb your lustrous locks when they are somewhat dry or semi-moist.In addition, when using a blow dryer, try to use it from midway to the end of the hair shaft. In other words, do not use it close to the root. In case you are dealing with frizzy hair, use a hair dryer with diffuser.Besides, it is suggested to use silk pillow cases while sleeping as they create less friction. Hence, they prevent tangles. Your choice of hair products also plays an important role in maintaining healthy hair that can grow fast.Thus, select your shampoos, conditioners and other hair-care products depending on your hair type, i.e., whether you have normal, dry, oily or combination hair type. For example, if you have dry hair, it is best for you to opt for an intensive moisturizing shampoo. You need to follow the above-mentioned remedies for at least a few months to get encouraging results because you cannot grow healthy hair overnight. Most hair packs mentioned here can be applied almost once or twice weekly. Needless to say, before applying any hair pack, make sure you comb your hair and remove all tangles to avoid breakage. When striving to grow beautiful long hair, try to eliminate problems like dandruff, scalp ringworm, scalp psoriasis, folliculitis, seborrheic dermatitis, and so on. Besides, certain conditions such as anemia, hypothyroidism, hyperthyroidism, lupus, etc. 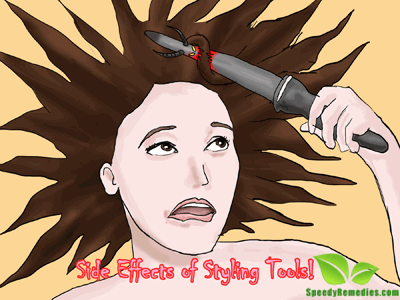 also affect your hair by causing hair fall and thinning of hair. Thus, nurture your hair and maintain good overall health to ensure faster hair growth. THANKS FOR EVERY TIPS.THEY WERE AMAZING AND IT REALLY WORKED.